The Meditub 2653 is a 26×53 bathtub designed to fit into tighter spaces while offering the ease of entering and exiting. Features include a built-in safety bar, and a 17” (chair-height) ADA compliant seat for ease of getting up and down. This clever walk-in bathtub offers full-body hydrotherapy while fitting into smaller places where most other soaking bathtubs won’t making it practical and convenient while still providing the comfort and luxury you want in your walk-in tub. It is constructed of durable fiberglass with a triple gel coat finish. The stainless steel frame provides long lasting strength and is adjustable for easy installation and leveling. 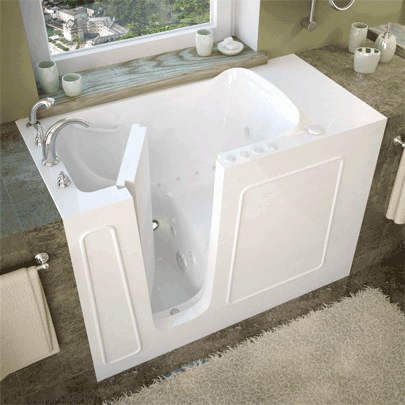 Many walk-in tubs feature other elements of therapeutic bathing, such as water or air jets, aromatherapy and chromotherapy to further enhance bathing and hydrotherapy, while others include shower configurations to allow for secured bathing with a shower instead of a bath, or for a combination of both.